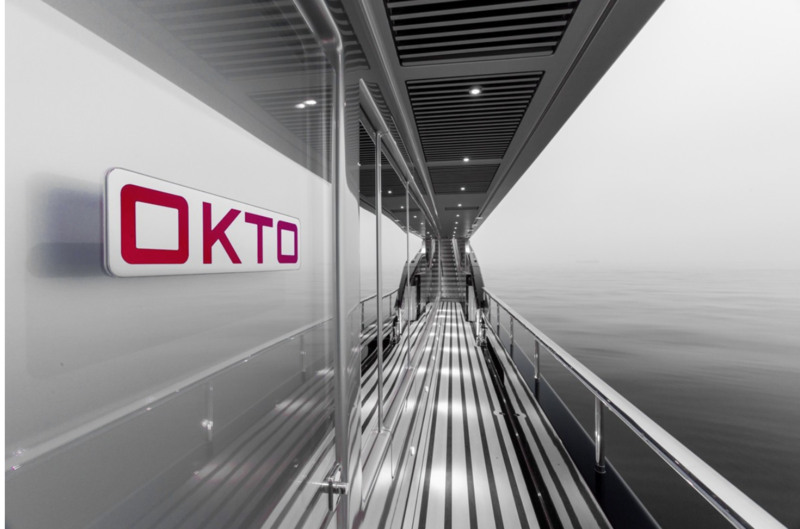 [vc_row][vc_column][vc_column_text]Okto is a 66.4m striking superyacht with a silver superstructure and black hull. She stands out impressively whether at anchor or on the water. Available to charter in the East Med, Okto can sleep up to 11 guests in five superbly decorated cabins. The interior was designed by Alberto Pinto with the owner’s suite having a private balcony that can be folded down just by pressing a button. The huge circular dining room, comfortable TV lounge, and gym provide all the facilities needed when chartering a vessel of this kind. Culinary delights of the Mediterranean are available at each meal time which is served by a friendly crew. There’s also a fabulous infinity pool situated on the aft deck with a lounge area close by. The sun deck has a raised Jacuzzi with plenty of sun pads around. Another lounge and al fresco dining area are just a few steps away offering secluded places for guests to relax. With special eco-friendly plastic decks, ladies can still wear their stilettos whether for a party or an evening celebration. 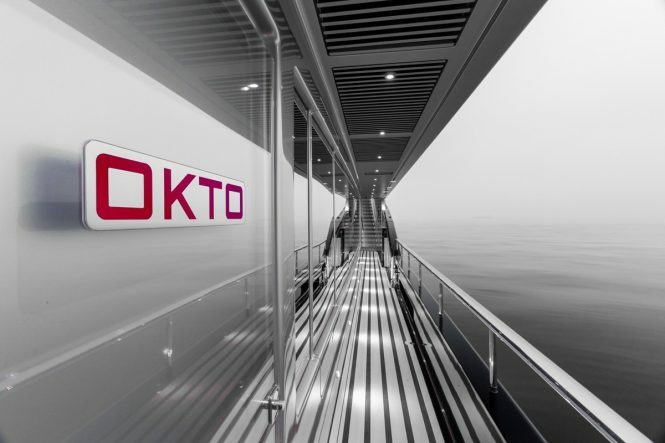 Okto’s main feature is a 6m contraflow heated pool also on the aft deck. All of the outdoor space has been maximized while movement between the interior and exterior is quite straightforward.